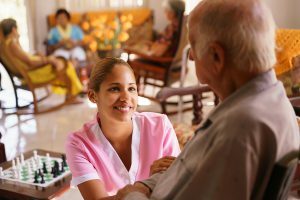 Finding a reputable long-term solution to disposing of medical and pharmaceutical waste for long-term care facilities, nursing homes, and hospice care is simple when you use Medical Waste Pros. We’ll get you free, no obligation quotes on mailback and regularly scheduled pickup medical waste disposal. The goal of our service is to help your facility find a local provider that can help save you money, ensure you’re in regulatory compliance for your state and national regulations, and protect your residents and your employees from hazardous and biological dangers that arise from improper disposal of sharps, medical waste, and pharmaceutical waste. Our experts can help you determine the right type of containers you need, and help you find the right provider and schedule the frequency that works best for your facility. We also offer large volume containers to serve large LTC facilities. There’s a national rule that affects ultimate users of medication and long-term care facilities that ensures secure disposal of controlled medications through mail-back programs, take-back events, and secured on-site receptacles. This rule allows you to dispose of expired or nonviable medications safely by taking them to a retail pharmacy or your doctor’s office– but long-term care facilities need to ensure compliance and document through manifests to ensure that all medications and medical waste is handled properly. Medical Waste Pros can help you find a local provider to help navigate you through the intricacies of the state regulations that you need to comply with- get free quotes on medical, pharmaceutical, and hazardous waste disposal today! Medical Waste Pros can help you find a reliable local medical waste removal provider for sharps disposal, regulated wastes, biohazard disposal and more. To get started, fill out the form to the right, or give us a call at (888) 755-6370. Within minutes, we’ll get you free, no obligation quotes within minutes!